Returning to the quiet village of Welford, in Yorkshire, Mandy Hope’s life is about to get very busy. Helping out at her parents’ veterinary practice, Mandy tries to balance work life in Welford together with home life in Leeds with her boyfriend, Simon. She soon finds herself pushed to the limit. When Mandy comes across some sick animals on a local farm, she takes them in. Nurturing them back to health, Mandy has her work cut out. With Simon back in Leeds speeding ahead on his plans for their future veterinary practice, Mandy finds everything spiralling out of control. Mandy and Simon appear to want the same thing in their careers, but unexpected happenings cause Mandy to re-evaluate her life. Which one of them will sacrifice part of their dream to please the other? Or can they both get what they want, be happy, and stay together? When her best friend James is dealt a devastating blow, it serves as a reminder to Mandy of what’s truly important in life. It also shows us a glimpse of the real person behind one of the other characters. We meet plenty of supporting characters in the book which help the story come to life and move it forward. I was a little disappointed by the lack of ’scene time’ that James’ character had, considering how close he is to Mandy. We see him at the start and then again two thirds of the way through. It is a shame, especially with the drama going on in his own life. I’d hoped to read more about Jimmy’s character, too. I felt there wasn’t enough interaction between him and Mandy. It seemed a little wishy-washy. Most of the characters were likeable. There was only one who I disliked from the outset. The author slowly gave more reasons to confirm my initial feelings. At one point I thought the author was going to try and sway them into a more likeable character but thankfully this didn’t happen. It would have ruined the book and made a character close to them seem feeble. Set around the theme of animal rescue and veterinary practices, it wasn’t a subject I was that familiar with, which made it all the more refreshing to read. The author is a qualified veterinarian and her knowledge is evident throughout. The detail on medical practices and animal care is superb and you get a real sense of the procedures carried out. I found some of the storyline predictable. I detected the clues well in advance and wasn’t surprised by the end of the book. There is a great deal of scene setting throughout the book. Although very detailed and picturesque in my imagination, at times it was a little too much. I found myself skimming some of the words. The book is well written and the storyline was good. I enjoyed the animal rescues and outcomes. When I reached the end I wasn’t entirely satisfied. It wasn’t strong and final. I felt there was something lacking but I couldn’t fathom what. Lucy Daniels is the collective name for the writing team that created the bestselling children’s book series Animal Ark. Hope Meadows is a brand new Lucy Daniels series for adult readers, featuring the characters and locations that were so beloved in the original stories. 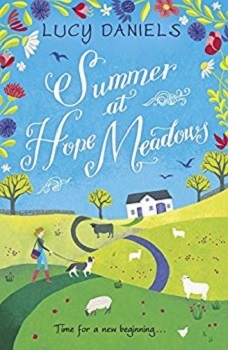 The first title in the series, Summer at Hope Meadows, has been written by a new author called Sarah McGurk, who has the twin advantages of being passionate about Animal Ark and a fully qualified vet! Sarah was inspired by James Herriot to become a veterinary surgeon some thirty years ago. A few years after qualification, she realised she wanted to follow him further, into the world of veterinary writing. She began with short stories, then longer works of fiction, related to her work in general practice and in emergency and critical care. Her special interests include anaesthesia and pain relief, and low-stress techniques in small animal handling. Sarah currently lives in Norway. She has worked for two years in a local veterinary practice and speaks Norwegian fluently. This is a unique concept for a book. Not my type of book though. I enjoyed reading your review! Thanks for the review! I may pass as you weren’t too jazzed about it. This isn’t something I would typically read, but I love your review! I’ve been known to skim words here and there too when the description gets too long. I’m glad the author chose to keep the one character you hated the same throughout the story. Ohh great review, this is the first time I heard about this book. It does looks and sounds great. Thank you so much for sharing. I hate feeling like there was something lacking and not being able to put my finger on exactly what. It leaves a sour taste for sure.